It goes without saying that we're product junkies over here at NaturallyCurly. When we hear about a new product line, we jump at the chance to test it out and talk to the creators behind it. Check out Monica “Queen” Carruthers’ natural hair journey and see how she ended up helping to create a product line that, in her 21 years of hair care expertise, she wholeheartedly stands behind. Can you tell me a little bit about yourself and how you got started in the hair care business? I've been in the hair care business around 21 years. I started when I was about 13 when I developed an interest for hair. I spent a lot of time in the salon because my mom was a stylist. She still is to this day, 40 plus years! You know, just being around, catching on to the different techniques, I developed a big interest in it and started to do it. It has basically been my life and career since about the age of 16. I am. I have been natural at right around 10 years. Wow! Can you tell me about your natural hair journey? "I do a lot of hydrating. Hydration plays a big part in having healthy hair. Period." I grew up on the permanent waves to the relaxed hair and wearing braids as a child. As an adult, I always wore relaxers. I always had an issue with color, though, and with wearing two chemicals: the color and the relaxer at the same time. I was one of those people who just could not do both. My love for color encouraged me to learn more about natural hair and letting my relaxer go. I just decided that color was greater to me than wearing straight hair, and I decided to go for it. I was probably with the natural afro look for about two years. After that, I decided to go ahead and loc. That is where it started. I was able to wear my color treated hair along with my natural hair and locs without having to worrying about the things that come along with wearing two chemicals: color and relaxer. How do you maintain them? I maintain my locs pretty much the same way that I maintain my hair. There are a lot of similarities since hair is kind of general when you step away from the chemicals. I do a lot of hydrating. Hydration plays a big part in having healthy hair. Period. I always seek out shampoo and conditioners that keep my hair hydrated. Then I follow-up with an oil. I maintain that pretty much once a week, applying the oil, just to keep it hydrated. I use U R Curly Soya Shampoo and Quinoa Conditioner because I love the ingredients in the products. That is basically how I maintain my locs. Are you sulfate-free and all natural in the products that you use? Oh, yes! Definitely. U R Curly is sulfate-free, with no parabens, alcohols or things that cause irritation. We stay away from those ingredients. We have an all natural, soy based shampoo, our conditioner is enriched with quinoa, and our enhancers, which I don’t use because I have locs and I don’t need the enhancer, are sulfate-free with no parabens or alcohols as well. 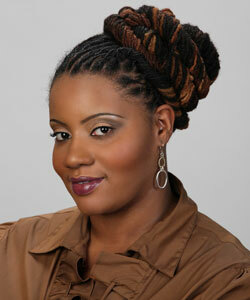 I do use the enhancer on my natural clients and on clients with relaxed hair too. What hair type is the enhancer best for? I would use the curl enhancer with any type of hair with any type of pattern, be it a wave, a curl, tight or loose. It doesn’t matter about the ethnicity of the person as long as you have a pattern. When they purchase the product, I tell people to use the enhancer as liberally as they like because it dries with the hair. It is enriched with oil, which acts as a protector and a buffer for the hair between the different natural elements or over processing. You mentioned that you use the products on your clients as well. Could you talk to me a little bit about your experience in cutting and styling natural hair as a stylist yourself? Well, if I had a client that came in who was in the beginning stages of transitioning and we were going to do the big chop, I would actually use the U R Curly shampoo and conditioner and then create a nice cut that framed her face. Cutting for me, I guess, it comes easily. I’ve been cutting a long time. Yeah! There are a lot of similarities in all hair types. There are, of course, a lot of different techniques, but to me, natural hair is a lot easier to cut. Really? That is a first for me to hear! How so? Because I started out being a chemical stylist first, by the time I started getting more into the natural side, cutting different textures of hair was just second nature. I have not run into any problems with cutting natural hair. I’m basically clipping ends, looking for straight or weak areas and mostly promoting growth. I recommend to a person who is natural to keep the ends trimmed. Sometimes, you may need to blow the hair with a blow drier to straighten it a bit to get an accurate cut. Again, I don’t see natural hair as being complicated to cut or style. How often should naturals get their hair trimmed? If you are wearing flat iron styles a lot, you will probably need to trim at least every eight weeks. If you are a person who is just wearing twist outs, two-strand twists or braided styles and you are not applying a lot of heat, you could probably be trimmed about every three months. It really just depends on the person and how active they are with their hair. I’m big on explaining to my clients how to comb their hair out to make it softer and what products to use, so that there isn’t a whole lot of unnecessary tugging and pulling to avoid excessive split ends. Once you master those things, you can kind of get away with three months or even longer. What about your AskQueen website. Can you tell me a little more about that? My thing is that I never hold back on giving people hair advice. If they value my opinion and my professionalism and value what I say, then I offer it. AskQueen is a site designed for stylists or clients who are having hair issues and don’t know what to do and want advice. It is free of charge. You just log in and post something in the forum, and within 24 hours, I will reply. People have always poured out to me, so I felt a need to make myself available to others. If they are willing to ask, then I am willing to answer. That’s great! So tell me about you and U R Curly. I helped to create U R Curly, and I was one of the lead people to help test the product. "I think that is most people’s objective [growth]. I haven’t had too many people say that they don’t care about their hair growing!" It was something that I was saying for a long time, that there needed to be a natural line. These ingredients were the ones that I felt like the product needed. When U R Curly was presented to me, it was on a trial basis. It was not out or known to anyone. We were just in the testing stage. Once we really got the product where we wanted it, it was time to launch it. It was a great success! Let’s talk a bit about the line. I’ve been looking at a lot of the ingredients in the U R Curly products, and this quinoa conditioner seems to be very unique to the line. Can you tell me about it? Quinoa is a grain. It is high in protein, calcium and iron. It is a good source of vitamin E as well. It contains a balance of amino acids, which is needed for protein, and protein strengthens hair. We were very adamant about finding the best ingredients to promote healthy hair growth, whether your hair is natural or relaxed. That is why the quinoa conditioner is so unique. There aren’t a lot of products out there that have the ingredients that U R Curly products have. That’s great! You are speaking right to the heart of the community in promoting growth. Our thing is to continue to promote growth by teaching, training and just educating people on the most vital things that you need as far as your hair. People often don’t include hair as part of the body, but it is and you can’t take that away from who you are. You want it to be healthy no matter what style you choose, be you natural or not. Do you have any tips for women who are considering going natural or who are newly natural? Yes! U R Curly believes that natural is a lifestyle, and we work to make your natural lifestyle a whole lot easier. We believe that our ingredients work to your advantage to enhance your natural curl. 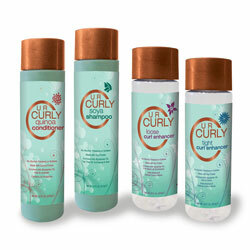 U R Curly is very versatile since it softens, moisturizes and adds shine to the hair. My tip for anyone considering going natural is that I first ask them, “Do you know where you are trying to go?” It's a journey. When you are putting something into your GPS you need an address. Whatever your destination is, know that from the beginning. Then, along the way, learn as much as you can and take in as much as you can because it is not an easy transition. Most of us have been relaxed our entire lives and so we are just now learning how to properly take care of our hair. It is new and you need help along the way. And that is why we are here, to help people along their way and along their journey. If they have any questions or need any hands on help, we are here. That is my thing. Own you! Accept your uniqueness. We look forward to hearing from everyone! The line is new, but we are hitting the ground running with it. We are just trying to get it out there and let people know that we have a product we really believe in. We stand behind it.